Can you imagine being told all your life about a big event coming but year after year nothing changes so you put the whole idea on a shelf called “someday.” If you have been a Christian a long time you have probably heard often that Jesus is coming back soon. I used to look up into the sky as a child and wonder if it would be that day. I was a little scared and a little excited. As time went along I didn’t glance up as frequently. That’s how the Jews felt as they waited for the coming of the Messiah. From the very beginning they knew they needed one. When Adam and Eve sinned in the garden they lost the deep intimate fellowship they had with God. “They heard the sound of the Lord God walking in the garden in the cool of the day, and the man and his wife hid themselves from the presence of the Lord God among the trees of the garden” (Genesis 3:8). After sin they were no longer at ease with God’s perfect holiness. What could restore that which was lost? Almost immediately God alluded to one who would come to do so. He spoke to the serpent (Satan) who had tempted the first pair to sin. “And I will put enmity between you and the woman, and between your seed and her seed; He (first reference to the coming Messiah) shall bruise you on the head, and you shall bruise him on the heel”(Genesis 3:15). Messiah means Anointed One in Hebrew. The Greek equivalent of Messiah is Christos so every time the New Testament speaks of Jesus Christ; you could substitute Jesus, the Messiah. A central theme of the Old Testament is the expectation of a Messiah by the Jewish people. Yet by the time Jesus actually showed up many didn’t recognize Him. Why not? Perhaps for some there was tiredness in waiting and the “someday” shelf was dusty after such long delay. Yet for others, especially the leaders, that was not the major problem. The real problem was what kind of Messiah they were expecting. The Jews were under the control of the Roman government; not free to fully practice their religion or determine their own political destiny. They viewed the Messiah as someone who would come as a kingly conqueror, and restore the kingdom of David and Solomon. They no doubt felt they had plenty of scriptural back up to defend that position. Perhaps they looked to scriptures such as this: “Thus says the Lord of hosts, ‘Behold, a man whose name is Branch, for He will branch out from where He is; and He will build the temple of the Lord. Yes, it is He who will build the temple of the Lord, and He who will bear the honor and sit and rule on His throne. Thus, He will be a priest on His throne, and the counsel of peace will be between the two offices’”(Zechariah 6:13). There were also many others that pointed to a victorious Messiah. Did they forget about the original problem that had caused a need for a Savior—a Messiah? It was sin, not an earthly kingdom lost. God’s solution was an all encompassing one, not a temporal one good only for a particular generation. When the Messiah came He settled the sin problem for ALL of mankind. “For God so loved the world, that He gave His only begotten Son, that whoever believes in Him should not perish, but have eternal life” (John 3:16). Some, however, were ready to receive Jesus as the long awaited Anointed One. When the Lord asked His disciples who they thought He was, Simon Peter answered, “’Thou art the Christ, the Son of the living God’” (Matthew 16:16). People have been discovering that truth down the years ever since, and those who do experience the reconciliation with Father God planned for since the first sin. What about you? Have you discovered it? 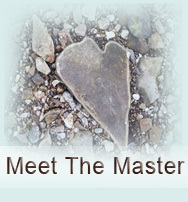 (See MEET THE MASTER for more information). Okay, so what about reconciling those scriptures about the Suffering Servant with the Conquering King? Actually, the same Messiah fulfills both prophecies. When He came the first time, Jesus suffered and died and rose again and then ascended back into heaven. At His Second Coming we “will see the Son of Man coming on the clouds of the sky with power and great glory” (Matthew 24:30). In the last book of the Bible, Revelation, He declares: “’I am the Alpha and the Omega,’ says the Lord God, ‘who is and who was and who is to come, the Almighty’” (Revelation 1:8). Remember that “someday” shelf we spoke of in the beginning? It would be easy to grow weary of waiting for His return wouldn’t it? Don’t do it. Just as many were not prepared for His First Coming, many will not be prepared for His Second Coming. Don’t let that be YOU. “’Therefore be on the alert, for you do not know which day your Lord is coming’” (Matthew 24:42). Now continue your study with Adoni or another of the Names of God.